Matted fur is unsightly, unhygienic and all around unpleasant for both you and your dog. Regular brushing and grooming will prevent most knots from developing, but occasionally a chunk of your dog's coat may become matted despite your best efforts. The good news is that there is no reason you cannot untangle the hair and return your dog's healthy coat to its former glory. Untangling matted hair should be a basic part of your dog's bathing and grooming ritual. Brush out your dog's coat as completely as possible. Matted, knotted hair is more difficult to detangle when it is wet, so you want to make sure your dog's hair is free of tangles before you get started bathing. Remove stubborn tangles by using a detangling product designed for use on dogs and then brushing the tangled hair out with a brush or comb. The majority of matted hair will come untangled with sufficient grooming effort on your part. Make sure your dog is completely brushed out and has no knots left in his coat. 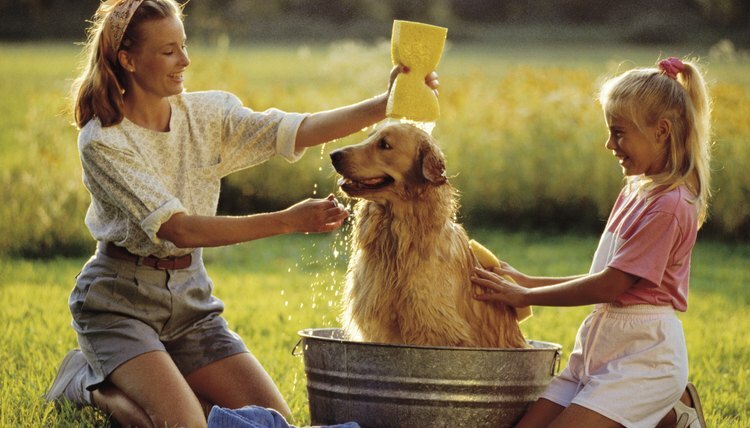 Wash your dog by wetting him down in either the tub or with a water hose. Shampoo his coat and then rinse the shampoo out and apply conditioner. Allow conditioner to sit on your dog's coat for several minutes, use conditioner liberally on areas that are prone to tangling. Rinse conditioner out of your dog's coat. Towel dry him and then brush his coat one more time, making sure no new knots developed during the bathing process. You can use a special brush designed for removing matted fur, but it is not necessary. If you are unable to get the tangles out of your dog's fur, you will need to take him to the groomer so that a professional can remove the matted fur.